Newly digitized Sanborn Fire Insurance maps of Mauston, Wisconsin, provide more detail of the sprawling Mauston Brewery complex that once covered much of the land at the corner of Morris and Winsor streets along the Lemonweir River. 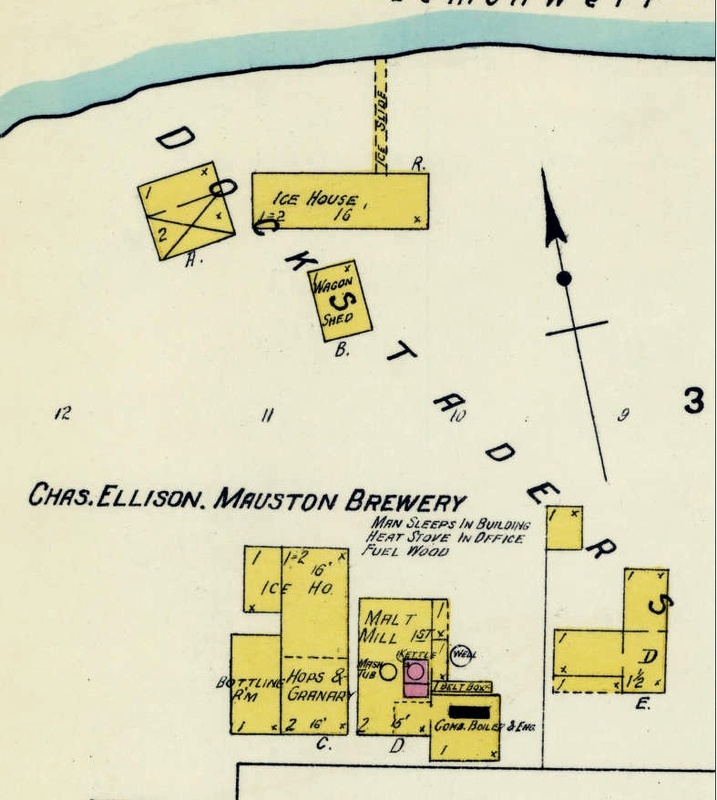 The 1894 fire map shows two Mauston Brewery buildings near the home at 22 Morris. The old Hanneman home at 22 Morris Street was built around 1893 by Charles F. Miller, owner of the Mauston Brewery. 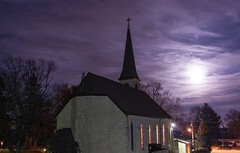 Many of the details he put in the home — stained glass, hand-carved woodwork — remain to this day. The Sanborn maps show that the land around the home once included a bottling works and another out building related to the brewery. It is interesting that Morris Street is incorrectly labeled as Main Street on the 1894 version of the Sanborn map. By 1909, the bottling building near the Miller home was gone. Across Winsor Street, the map shows a malt kiln, mash kettles, a well, a granary, an ice house and other outbuildings. The map notes that the buildings area heated by a wood stove, and a brewery employee sleeps in the building. 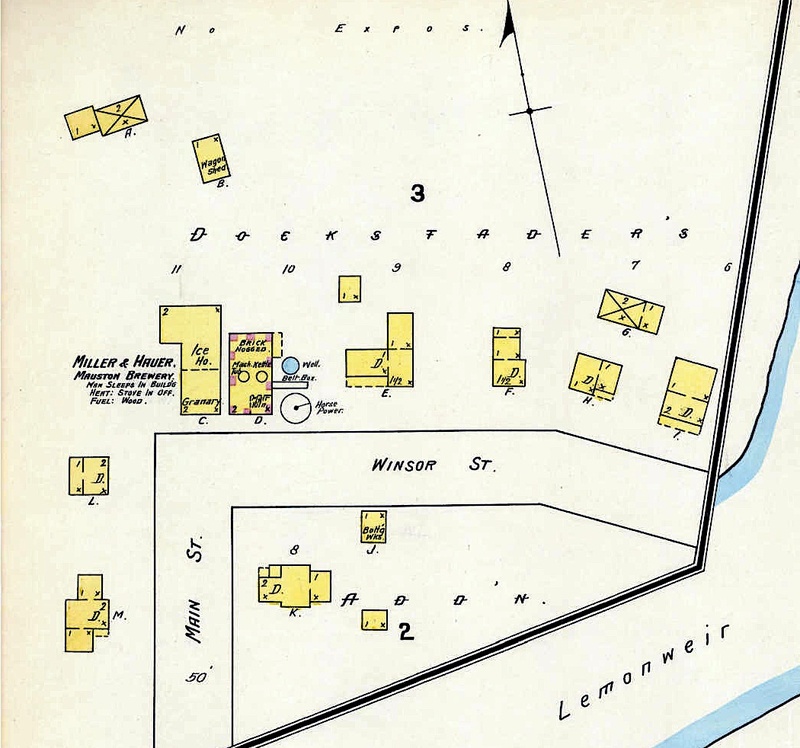 The 1909 version of the Sanborn map shows addition of a second ice house on the shore of the Lemonweir River. Brewery workers cut ice blocks on the river in the winter, then moved them on a slide to the ice house. The 1909 version of the map shows a second ice house near the river. Charles Miller died in 1907, ending that family’s involvement in the brewery. Charles Ellison continued operating the brewery. By 1916, the brewery had ceased operation, according to Rossin’s book. A pickle factory started operation on the property, but it burned to the ground in 1922. 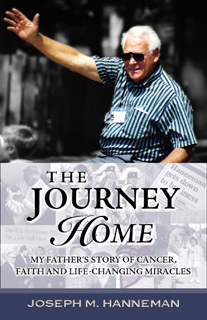 Dr. J. Samuel Hess Jr. bought the land and built a brick ranch home in 1928.